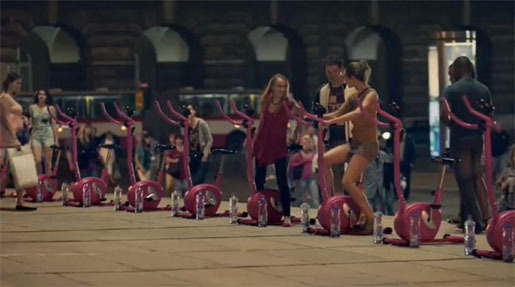 Contrex, the French mineral water brand owned by Nestle, is running “Contrex Ma Contrexpérience”, a television commercial centred on an outdoor experience. 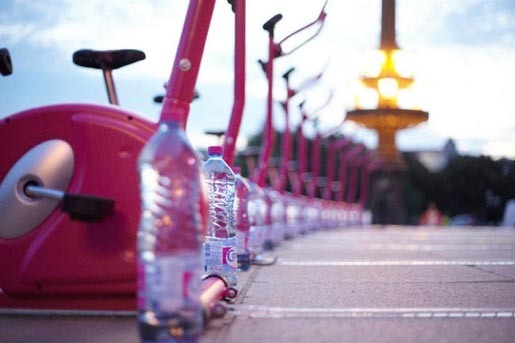 Nine women and one man work on ten exer-cycles to power up a spectacular building-size striptease show. At the crucial moment the crowd is congratulated: “Bravo! Vous avez dépensé 2000 calories” (You have burned up 2000 calories). The message is backed up on the Contrex Youtube channel and Facebook page: “Every year, magazines are announcing a new fad diet. And each time, the same conclusion: it does not work. To lose weight effectively and permanently, there is no miracle. You must adopt a balanced diet, drink water and exercise regularly”. 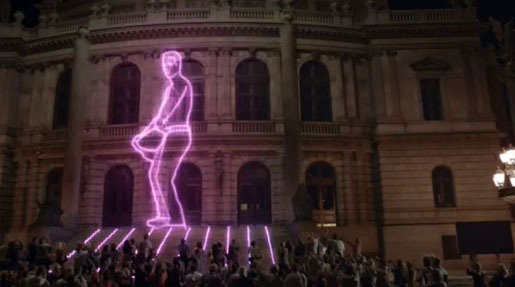 The Contrexpérience campaign was developed at Marcel Worldwide, Paris, by creative director Anne De Maupeou, art director Souen Le Van, copywriter Martin Rocaboy, account director Michel Kowalski, account manager Audrey Tato, TV producers Timothé Rosenberg, Cleo Ferenczi, planners Anne Dimier-Vallet, Guillaume Le Gorrec, working with Nestle Contrex marketing team Emmanuel Manichon, Marie-Cécile Pellé Lancien and Stéphanie Perrin. Filming was shot by director Xavier Mairesse via Wanda Productions with producer Claude Fayolle and director of photography Nicolas Karakatsanis. Post production was done at Mikros Image, Paris, by Sandra Haize and Olivier Glandais. Editor was Samuel Danési. Sound was produced by producer Clemens Hourriere and Boris Nicou at WAM and Matthieu Sibony at Schmooze. Music is a remix of “Comment te dire adieu” (It hurts to say goodbye) by Arnold Goland (English words) and Jack Gold (music), popularised in French in 1968 by Françoise Hardy.